(Testimonial three days after adoption) “Gidget and I went on a walk for the third day in a row! For those of you who don’t know what a big deal that is, previous to getting her, I never would’ve chosen to leave the house alone–we’ve also had three different unknown men unexpectedly come to the house to work on things and I didn’t have any panic attacks! Gidget has already made a huge impact on my quality of life, and she’s still in training. Ninna in her comfy spot! “I was scared all the time. 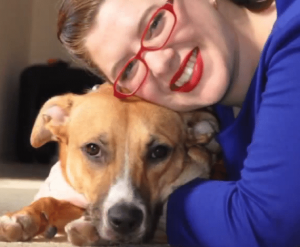 … What helped me to come out was that in there I decided to adopt a dog. . . She gave me a reason to live, and I think the first being in my life [I] trusted. . .in some ways she’s like my shield from the world and in others she helps me to be in the world. My relationship with Ninna is great. 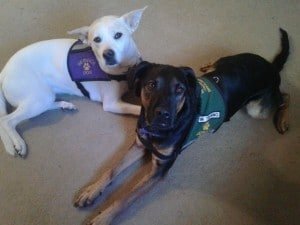 “My name is Tracy My service dog’s name is Finola. Finola was rescued from Hurricane Katrina. She helps me live a more productive life. She helps me go to the grocery store, bank, And other places away from our home. I have post traumatic stress disorder. I have many symptoms that go along with PTSD. Finola was trained to help me with my panic attacks. Without Finola I would be house bound. Finola is almost 9 yrs. old & ready to retire so I hope to start training my next PSDIT who will receive the basic training by inmates at the Grafton prison. 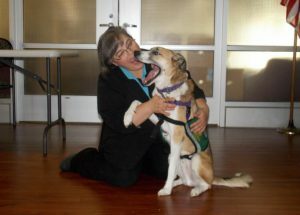 “Having started my experience in dog training using aversive and more forceful methods, I found it intriguing when Jane Miller showed me a gentler method. Her methods of positive reinforcement taught that you could train a dog and not damage the bond between trainer and dog. I have learned that the dog will follow cues willingly and not out of fear. Her tutelage and patience has given me a great respect for these wonderful animals. What I learned from her, has opened doors for me that would never have been opened before. Two weeks after my release from prison Jane assisted in getting me a full-time job at the Mutt Hutt. It’s recognized as the premier facility by Cleveland magazine. This would never have happened without the training she provided me. While still an employee at the Mutt Hutt, myself and another individual she taught have launched our own business called Everyday Dogs. We strive to use the methods she taught and provide a positive experience for our four legged friends. Thank you Jane.” – A.K. “I am in the dog program. . . because I love our domesticated dogs and I think that positive and humane training and treatment of dogs can drastically reduce the overpopulation and mistreatment of dogs. I want to learn and grow in the discipline of positive training and behavior modification.” – C.H. “I have learned a lot about dog behavior and most of all I’ve learned patience. I know now that dogs that are aggressive were not born that way. They went through troubles. I enjoy learning about the different ways to keep the dog’s minds going. Like the puzzles and different games we play with the dogs. I am looking forward to learning CPR and dog’s health issues and how to help them.” –J.C. “In the future, I would like to explore the possibility of opening up my own doggy daycare/kennel/training center. Also I’d like to continue to volunteer at my local animal shelter. If there’s any possibility I can be a voice for neglected or abused animals and help them find decent homes. That is my goal ultimately. 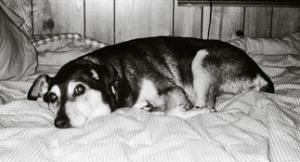 Also, to educate people on dog behaviors and why they do some of the things they do.”–W.P.